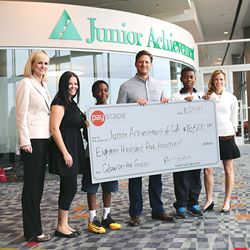 Payscape Advisors recently presented a check for $18,500 to the non-profit organization, Junior Achievement of Georgia, at the Georgia World Congress Center in Downtown Atlanta. The donation is the result of the Glow on the Green charity golf tournament, hosted by Payscape Advisors, at North Fulton Golf Course. In just two years, what began as an idea for a fun, nighttime golf tournament benefiting Junior Achievement, has transformed into a sold-out summer charity event. Glow on the Green combines a 4-man moonlit golf scramble, live music, and libations with an impressive roster of Georgia-based sponsors. “At Payscape we operate under the key principle of 'paying it forward.' From the employees and clients, to our partners and products, we continue to highlight that standard by delivering the best technology and service to our customers and communities. Our relationship with Junior Achievement allows us to play a part in empowering and enriching the lives of our future generations,” says Adam Bloomston, Co-Founder and Chief Financial Officer at Payscape Advisors. Dozens of local businesses, including State Bank & Trust Company, Waffle House, RegPoint Solutions, Milner, TriNet, GoEnergy, Palmer & Cay, and Lovies BBQ, as well as global brands like Troutman & Sanders sponsored the event. “Junior Achievement of Georgia is grateful to Payscape Advisors for their continued partnership. The annual evening golf tournament is one of many ways the company continues to show their support for JA and our mission to inspire young people to own their future economic success,” said Jack Harris, president and CEO of Junior Achievement of Georgia. To view photos and video from Glow on the Green and keep up with next year’s planning, please visit http://www.facebook.com/GlowOnTheGreen. Payscape Advisors is the leading integrated financial technology company dedicated to making it simple for business owners to collect money. We're a team of inspired entrepreneurs intent on disrupting the commoditized payment landscape with cutting-edge products and services, universal API integration, best-in-class customer service, strategic referral and technology partnerships and a lifelong devotion to helping small to mid-size business owners increase cash flow. Learn how to get paid quicker at http://www.payscape.com. Junior Achievement (JA) of Georgia is dedicated to giving young people the knowledge and skills they need to own their economic success, plan for their future, and make educated academic and economic choices. JA programs are delivered by corporate and community volunteers, and provides relevant, hands-on experiences to students from kindergarten through high school. JA of Georgia offers multiple programs, including in-class programs, JA BizTown, JA Finance Park and JA Fellows, all of which focus on entrepreneurship, personal financial literacy and workforce readiness. During the 2013/2014 school year, JA of Georgia served 164,000 students statewide through five district offices located in Atlanta, Columbus, Dalton, Gainesville and Savannah. For more information, visit http://www.georgia.ja.org.